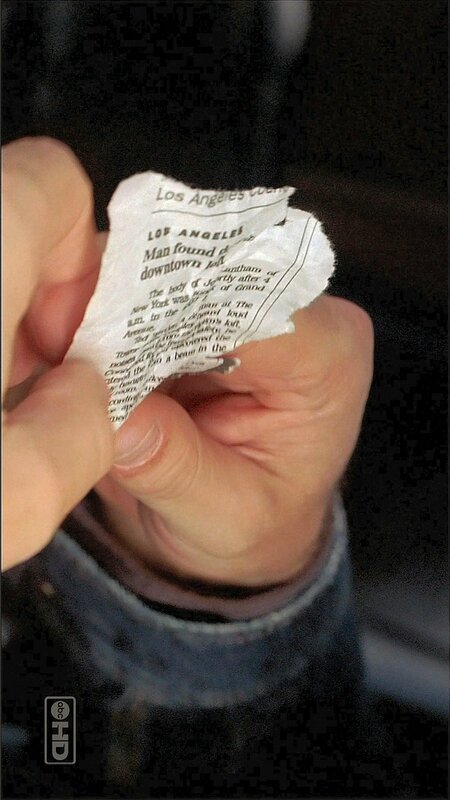 Can you make out what that newspaper clipping actually had written on it? I sure couldn't, my mere guess being it must be an obituary of some kind, possibly one of our dear Losties post-Island. 2) First name possibly begins with a J. 3) Last name ending in "antham"? 5) Died in "The Tower" (Apartments?) on Grand Avenue in downtown Los Angeles, possibly a reference to the as-yet-unbuilt Grand Avenue Project. Like the last point, nice continuity. Thoughts? UPDATE - Like this I read on Lostpedia's article - "Ted", "The Tower", and "beam" are all references to central characters or places in Stephen King's "The Dark Tower" series of books, and other books that allude to the Dark Tower, such as "Hearts in Atlantis"
We know the writers love King's work, so a good easter egg possibility. Also liking the idea that it could be a reference to the philosopher guy, Jeremy Bentham. Again, something the writers like.